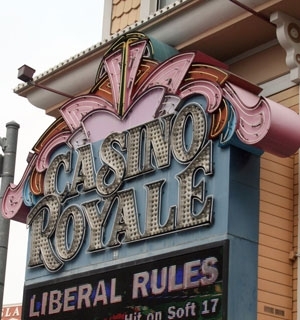 The Casino Royale is smaller size establishment in a great location. It caters to those looking for value on the Las Vegas Strip. It has a solid following of people looking for lower limits games, lighter fare food, and drink specials. It is a Best Western property and many of its casino goers decide to lodge at its facility. The rooms clean and spacious with large beds. Rooms have a coffee maker and small refrigerator. There is an exercise facility for guests. It features a business center with available computers and printers. The casino offers a variety of the most popular table games and slots with fast and friendly beverage service. A full service bar is inside the gaming area. There are gaming promotions available. White Castle hamburger restaurant is connected to the casino and a Denny's is adjacent to it.